While there are pages upon pages in our archives covering Meghan’s style choices when she was Meghan Markle, there is one category of archive that is so uniquely British and distinctly royalty-adjacent that it practically didn’t exist before the Duchess of Sussex did… The fascinator category! Since joining the royal family, Meghan has taken her topper game to a whole new level and surprised us with several chic – and occasionally inexpensive – options. 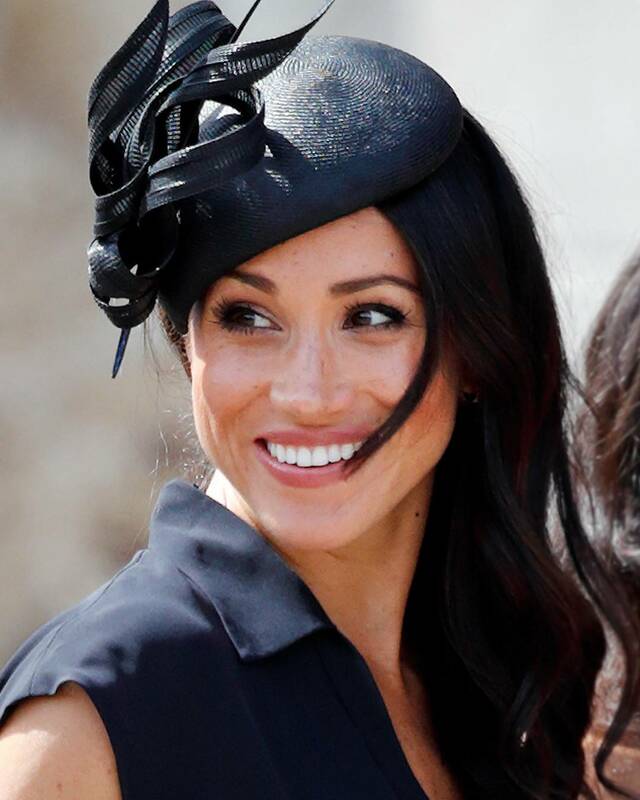 Since fascinators aren’t a North American tradition that Meghan would be accustomed to, it’s very likely that she’s brought in some help to select some styles that would flatter and specific milliners to work with. We thought we’d ask several members of our team to pick out a hat that we think would be perfect for Meghan to throw our proverbial hat into the proverbial ring as “fascinator stylists” for the Duchess of Sussex. Finding the perfect hat is often difficult to pull off – it’s got to have a mix of personality & elegance, match with your outfit and ideally stay true to your style ethos. That’s why Laura loved the combination of the Panama Hat (a long-time favourite of Meghan) with the elegance of a minimally jewelled mesh. 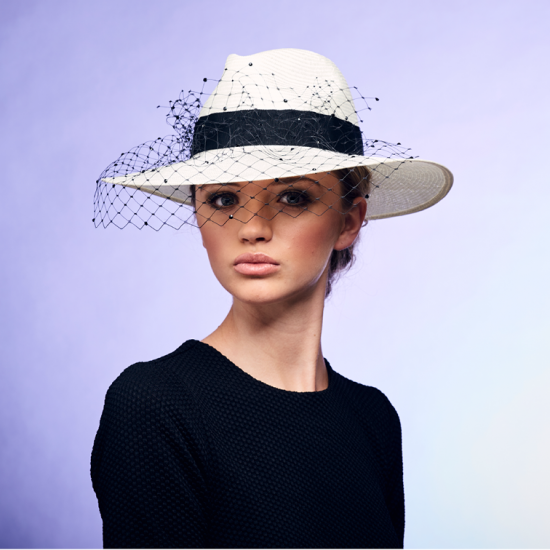 Check out the Rosie Olivia ‘Bravo’ Hat which retails for £500.00. There are a few milliners who have earned their stripes as the creme de la creme of London hat society, including well-known milliner Philip Treacy. His hats are often seen atop some of the most glamorous heads in the United Kingdom and beyond. Meghan has already turned to this brand, and Christine couldn’t resist selecting one of his creations for her top(per) pick. A good hat doesn’t need to break the bank – just style records! Meghan showed us all this by wearing a topper from Marks & Spencer and we think she’d approve of the budget-friendly styles at Debenhams, which has a great assortment and ships internationally. Amanda selected a £45.00 fascinator that would look great with a navy look. I, like Meghan, love elegant, chic dressing and I especially love when you can throw in some budget-friendly pieces to go with your investment ones. This budget friendly hat adds some great style – and as the model shows, would look amazing with Meghan’s trademark “messy bun”! Check out Debenhem’s ‘Debut Navy’ Fascinator, which retails for £45.00. Leave it to our stylist to pick not just one but three! Audrey picked a mix of hats that are affordable, Meghan’s style and all very stylish ways to top off a look. We’d love to see some of your picks for Meghan’s hat style – do you have any thoughts on looks she’d look divine in? Thanks for such a fascinating post MM!! 🙂 I love all the styles that the MM crew have selected and I’m sure that Meghan would look lovely in any of them. I love reading the yearly articles about various Lady Day events at British race tracks that bring out some incredible and quite ornate head wear, personally the fascinator that Meghan wore to Ascot is my favorite so far. I’ve been a hat wearer for quite some time, wide brimmed hats for summer, felt hats and beanies for winter but I’ve never tried on a fascinator, I just might have to. LOVE the veiled Panama hat. Otherwise I am not very into hats, especially the Treacy ones with the huge cabbage rose under the brim. I think a lot of hats are just too fussy for me. Wish we wore them here in the USA….I actually look good in them! I just wish she would wear another color other than navy blue or black. Her style of fascinators is lovely but the repeating of either black or navy blue is really a bit boring. She has quite a collection of navy and black toppers! I am not a fan of the flying saucer style she wore to the trooping of the colors. I also think white looks too “bridal” unless there are color accents.